Taking some time today to update a mess of data and metrics I like to track. One of those things is the overall WhoScored.com player ratings. I like them for what they are and have been recording / tracking them since they started to include MLS back at the beginning of 2013. What that means is that I've got 72 games of Crew SC data of which to pick apart! Wow, time is flying by. Meram and Higuain take six of the top 10 spots here. Interestingly, six of the 10 are also from 2013. Looking farther down the list though, I see that 2014 dominates the 10-40 spots. Notably, Meram being the first Crew SC player to make top 10 each of last three years. 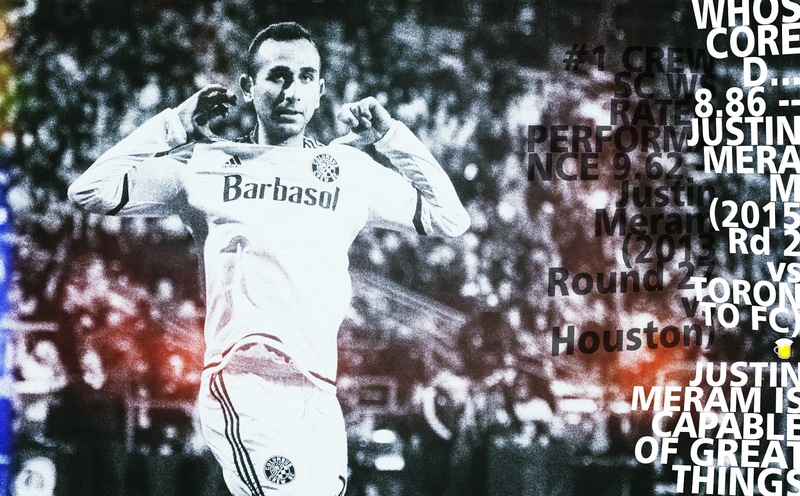 The top rated match by any Crew SC player since 2013 is Justin Meram back towards the end of 2013. He did just about everything in the middle of the field any MLS player has in this time frame. 80% passing on 46 attempts, 71 touches, 5 shots, 2 on frame. 4 key passes (one completely unselfish pass to Ryan Findley for a goal) and a couple clearances. The performances above are representative of what he can do at the MLS level - which is be dominate. What's interesting is that he never has a stinker of a game. It's only comparatively that we think he stinks it up sometimes. His magnificent performances set the bar high. A couple more notes for the Crew junkies out there: Not sure many will remember that Schoenfeld late season game vs NY. I played about as well as a forward can in MLS that night (and added a brace). That late season 2013 Marshall game was when old Chad rose up to try and carry the team into the playoffs under interim manager Brian Bliss (it almost worked). A key pass is a pass that leads to an opportunity. For the Crew, it's basically the "Higuain Stat." He's got 18 of the top 20 in this category. 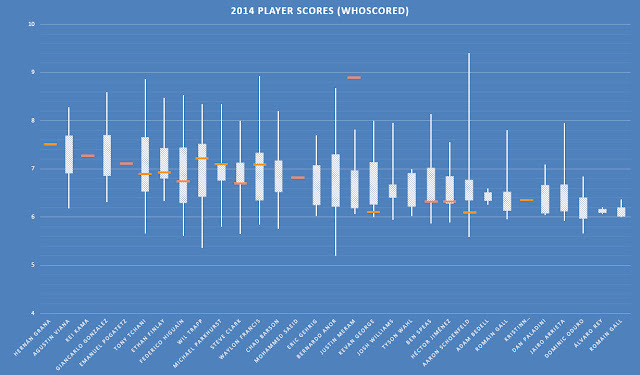 Next up is a simple check on top defensive performances over the past couple years. What I've done is take the total of a handful of positive defensive actions, add them up and divide by the total number of touches the player had. The actions are Duels, Tackles, Interceptions, Effective Clearances and Shots Blocked. Not everything Giancarlo did in that game was perfect (he did miss a couple passes) but Opta data often doesn't add quite up. Close enough for things such as this. Take it as "these dudes had really good defensive games that day." Okay, to finally get to why I'm here. WhoScored.com has a rating system that rates each player based on actions each game. Along with Squawka, I think they are a pretty darn good way to get a general feel on how well a player did that night. For people like me, it helps narrow my focus before digging in. On this box plot is each player's ratings from last year. The orange line is through the first two games this year. The new signings are on here, represented by the orange line only. So far Crew SC have hit on three of these guys (not as easy as they make it look, many times new guys are duds in MLS). I'll highlight Grana as an excellent signing. Pogatetz is a good replacement for Gonzalez and Kei is a massive upgrade at forward. All this is "so far" though. Only two games in.